We are very excited to announce that our video, House Sitting is Brilliant: Live the Dream! has won the House Sit Match competition! 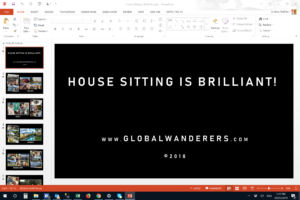 Asked to create a video based on the theme, “House Sitting is Brilliant because …” our submission was shortlisted and then declared the winner following a public vote! 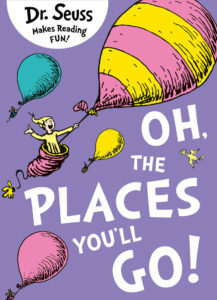 Whilst house sitting in Brisbane, after reading the video guidelines, I immediately thought of the Dr Seuss book, “Oh the Places You’ll Go” and thought a similar type rhyme could work as the basis for our video. Luckily the family we were house sitting for had young children and they had copy of the book, which I read and established the rhyming pattern so familiar with Dr Seuss books, something I had used many times as a teacher of young readers way back in my primary teaching days. I had also been involved with the musical Seussical (which is based on Dr Seuss) back in 2004 and the songs started to play as earworms, bubbling along the creative juices. And then, one night, after being out all day and following dinner, I sat and wrote the poem with Harvey the dog on my lap. Remarkably the text came quickly and even tricky rhyming words soon presented themselves, assisted by suggestions from Christopher. After leaving it for a few days, I returned to the text and re-worked it to a level of satisfaction for a final draft, knowing that things would change as the video came together. We have a lot of photos! In our two plus years of house sitting we have taken thousands of photos between us and more recently we have started to take video as well. So finding images to go with the text was going to be difficult. Not from not having enough photos but being able to find particular photos and match them accordingly. We made a shortlist of pictures that would go with particular verses and started to create a powerpoint presentation. We knew that we could save the powerpoint as a video so thought this was the easiest way to compile the various components, although we did contemplate creating it on our iPhone using imovie. Christopher used his graphic design skills to re-size photos and create some of the collages and it gradually came together. The first export from powerpoint was just the visuals, without sound. I then recorded the voiceover to add into the video, taking care to match the words with the visuals. After searching extensively we found the perfect royalty free music, which was longer than we needed and edited it down to exactly one minute. Adding the music to the video however meant that timings weren’t right as the beat of the music didn’t match with the previously recorded voiceover. So back to powerpoint to export the video with timings that matched the music, followed by recording the voiceover again to match the new timetrack and it all fell into place. Watching it through multiple times (like hundreds) ensured that all was in order. We submitted and it was done. Then the wait to find out if we had been shortlisted and wait again for the winner to be announced. It’s was a very enjoyable experience and a great way for us to reflect on our two years of full time housesitting. We hope that it may inspire others to ‘Live the Dream‘ too and realise what a great lifestyle house sitting is and can be. There are also other verses to the poem which didn’t make the cut due to time limitations. Who knows, they may be published at some stage in the future. Well done! All your research into how best make your video was worth it. From my perspective, I far more appreciated hearing your voice and poem; so more authentic and personal. I’m inspired. Hoping to bump into you both on an international house sit. Thanks Estelle! And we too hope to cross paths on this brilliant lifestyle. Safe travels.